Hum in an audio system is often caused by loop effects which act like antennas. These loops can easily pick up a 60Hz (or higher harmonics) hum transmitted by electrical wiring. Typically, these loops are connected via grounds, more commonly called "ground loops." The safest way to eliminate unwanted noise is with the CleanBOX II. The power ground of a synthesizer, connected to the signal ground of the synth, into a mixer's ground, then into a mixer's power ground. The power ground of a guitar amplifier, connected to a signal processor which has a second guitar amplifier on the other channel, and then the second guitar amp's power ground. 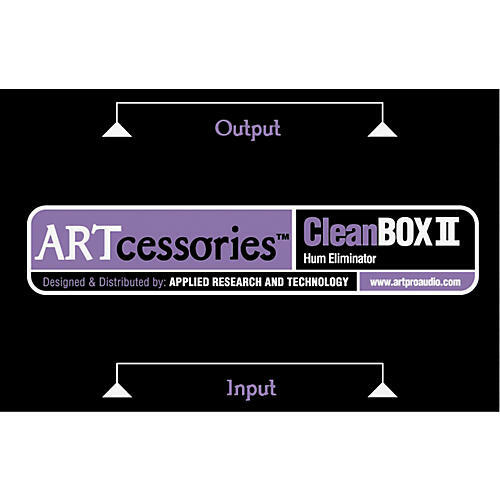 All such common ground loop problems are solved by the CleanBox II. Dimensions: 4-1/2" x 2-7/8" x 1-1/2"